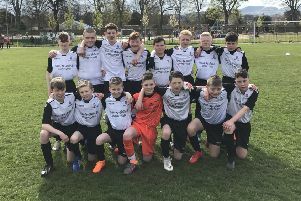 St Bernard’s and Hermiston Vale served up a nine-goal thriller in the Rex Gallagher Cup quarter-final, with Bernard’s scoring a late winner to triumph 5-4 at Royal High School 3G. LEAFA Championship leaders St Bernard’s were defeated 3-1 by the same opposition the weekend before in the league and were looking to make amends against Darren Black’s side. The home side started with just 13 fully fit players, but they were quick to settle. Euan Gilhooley flashed a header wide from a Sean Elliot cross on 12 minutes, before Vale keeper Martin Power made a vital stop with his leg to divert a Steven Clee effort onto the post. Rees Smith gave Bernard’s the lead on 23 minutes when he curled a 25-yard effort into the net moments after Callum Mulligan had come close for Vale. Vale were level three minutes later when Dale Horribine converted from the spot after Chris Campbell was tripped by Scott Thomson. Saints restored their lead on 36 minutes when John Paul McLennan powered in a header from a Smith corner, but defensive slackness allowed Vale to equalise on 42 minutes through Elliot. Right on the stroke of half time Clee’s shot on the turn restored St Bernard’s one-goal advantage, but it only took Vale ten minutes into the second half to draw level again through Mulligan. Smith scored his second goal of the afternoon on 67 minutes, but with just ten minutes to go, Vale remarkably equalised for the fourth time in the game when Jamie Aitchison netted from close range following a head-flick from Michael Elder. The game seemed to be heading for a penalty shoot-out, but St Bernard’s netted a dramatic late winner when Clee netted at the back post to book a semi-final berth. • Barca Milton 97 had an afternoon to remember as they advanced to the quarter-finals of The Scottish Amateur Cup after a 5-1 win over Cambusnethan Talbot AFC at the Dalziel Playing Fields in Motherwell. The LEAFA Championship outfit went behind to their West Region opponents in the opening few minutes, but they soon found themselves ahead with Lee Cairns and Scott Smith both scoring just before the break. Jordan Davidson handed Barca a precious two-goal advantage on 52 minutes and the right back netted a third before Cairns capped off a fantastic afternoon for the Capital side with a double to seal his hat-trick. Barca will now face the winners of the seventh-round replay between Oban Saints AFC and Letham AFC, with the home tie scheduled for March 25. • Sandys put the disappointment of their unbeaten LEAFA Premier Division record coming to an end the previous weekend with a 4-1 win over Musselburgh Amateurs to restore their six-point lead at the top. Edinburgh Rose overtook Tollcross Thistle to move into second place on goal difference after a 7-0 win over East Linton, Thistle having been in cup action on Friday night with a 2-1 win over Lochend Amateurs in the Challenge Cup quarter-final. Salvesen remain top of the Lothian West League after a 3-1 win over Queensferry Athletic, while Edinburgh South Vics went five points clear at the top of the Lothian East League with a 5-1 win over Musselburgh Windsor.